Why Do Radio Signals Travel Further At Night? While the phenomenon of better night-time radio reception might be foreign to a generation brought up on podcasts and streaming media, anyone who grew up tuning into far off radio channels late at night (or continuing to do so) can attest to the startling clarity a midnight stroll around the radio dial can provide. Why exactly are distant AM and shortwave radio stations so much clearer at night? While it would be tempting to imagine it has something to do with the cool night air or the silence that typically permeates the evening, the secret lies miles and miles above the surface of the Earth in the ionosphere. During the day, the ionosphere is bombarded by sunlight which ionizes the molecules in it. At night when the sun is blocked by the Earth, the lower levels lose their ionization while the upper and less dense levels remain fairly well ionized and full of energy. During this period of time, radio waves pass into the upper reaches of the ionosphere where they collide with the highly energized electrons of the ionized molecules. When the radio wave frequency and the electrons fall into alignment, the electrons give the signal a boost and shoot it back down to Earth. Depending on the conditions, this can happen several times in a row and, in the process, propagate the radio signal well beyond it’s daytime range. In fact, the propagation can be so significant that AM radio stations can easily broadcast in a thousand mile radius and shortwave signals can often bounce around the curvature of the Earth and be heard across oceans. 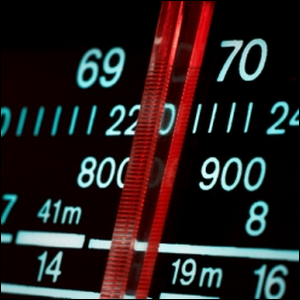 As a result of this, many AM stations either lower their broadcast power at night or kill their signal completely lest they spill over into other radio station’s broadcast territory. There are, after all, only around 100 AM radio channel frequencies in use but thousands upon thousands of AM radio stations. If all stations stayed at full broadcasting power at night, the radio would become unusable across entire continents. This phenomenon doesn’t affect FM broadcasts as FM radio frequencies are propagated almost entirely by a phenomenon known as groundwave propagation. The shifting of the ionosphere and the increased transmission length produced by extended skywave propagation has little to no impact on FM radio.